You could spend next Thanksgiving in Grandfather and Grandmother’s house! Lydia Marie Child wrote of traveling for Thanksgiving in her poem, Over the River and Through the Woods. The poem is sometimes written as “to grandmother’s house we go” but the original version, published in 1844, referred to grandfather’s house. 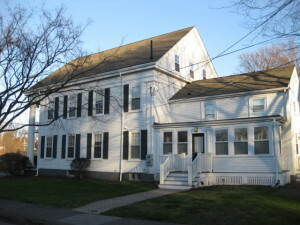 The river was the Mystic River and grandfather and grandmother’s house stands to this day at 114 South Street in Medford looking out at the river. The house that Child refers to is a smaller, modest portion that now serves as an ell to the large, imposing Greek Revival house that was added in 1839. Grandmother and Grandfather’s house is now for sale according to a postcard I received recently. It is listed with Hammond for $975,000. Wherever you’re celebrating today – enjoy! Happy Thanksgiving. This entry was posted on Thursday, November 28th, 2013 at 9:18 am	and is filed under Property Info. You can follow any responses to this entry through the RSS 2.0 feed. You can leave a response, or trackback from your own site.